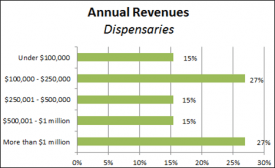 How much revenue does the average dispensary generate? Every entrepreneur looking to start a medical marijuana center asks that question early on in the due diligence process, but the answer is often elusive given the lack of industry data. As a result, most look to Harborside Health Center to get an idea of what’s possible in this industry. The California-based dispensary – one of the few MMJ operations to reveal financial data publicly – claims it generates more than $22 million in annual revenues, making it one of the largest cannabis centers in the nation from a sales perspective. Impressive, for sure. But most dispensaries don’t come close to those figures. Nearly 60% of dispensary owners who responded to a recent industry survey said they take in $500,000 or less in annual revenues, according to first-of-its-kind data in the newly released Marijuana Business Factbook, published by MMJ Business Daily. A fair share (27% of all respondents) reported sales of between $100,000 and $250,000, while 15% said they bring in less than $100,000 a year. Those numbers may sound surprising to newbies, and they certainly fly in the face of the media’s representation of the industry. But they reflect the reality of the situation: Opening a dispensary is not necessarily a route to quick riches. The good news is that if you put in the hard work, follow local regulations and implement best practices, the potential is indeed sky high. More than a quarter of dispensaries in the survey reported annual revenues of more than $1 million, and another 15% said they generate between $500,000 and $1 million. Dispensaries at the top end of the spectrum often have thousands – or even tens of thousands – of loyal patients, professional packaging and tested products, a dozen or more employees and multiple locations within one state. Dispensaries on the lower end (less than $100,000) typically are mom-and-pop shops or tiny storefronts in rural areas where the market is small. These dispensaries often have just a few hundred customers and are staffed by the owner and maybe a part-time employee or two. 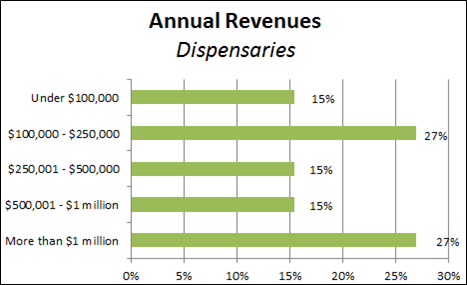 How big a dispensary gets from a revenue perspective depends on many factors, including local regulations, plant limits and permitting and licensing requirements (the higher these are, the larger dispensaries usually are). Additionally, it depends on the intentions of the owner. Some entrepreneurs prefer to fly under the radar given the industry’s shaky legal status, so they keep their dispensaries small to avoid unwanted attention and scrutiny. The findings are part of a larger survey of MMJ business owners conducted online in January. 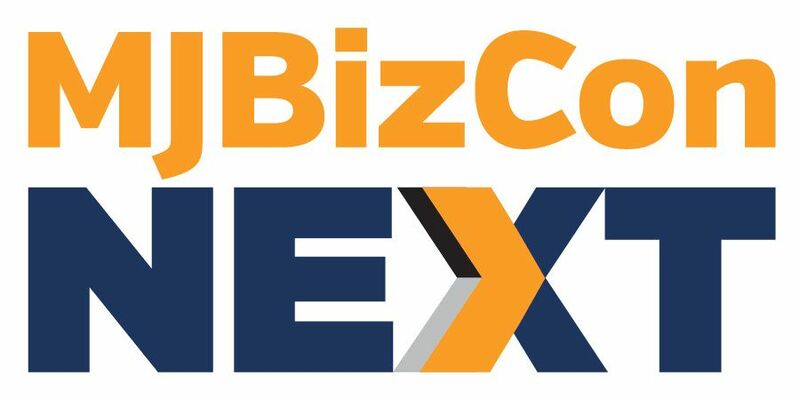 More than 130 cannabis executives – including those who run dispensaries, cultivation operations, edibles companies and ancillary firms – responded to the survey. Given the sensitivity businesses have when it comes to their own financial data, MMJ Business Daily did not require respondents to provide names or any other identifying information. Click here to get your copy of the entire 180-page Marijuana Business Factbook 2013, packed with exclusive financial, legal and market research data for cannabis professionals. I don’t think this tells the whole story. Clinics have such a hard time trying to operate when they cannot charge, tax, bank or use standard business deductions afforded other businesses. Allowed to function as a normal business would mean far greater revenue and profit. Large corporate lobbyist are already working law makers to make it impossible to open and operate a Mom and Pop store considering the outrageous fee’s being proposed in some States. So those of us who have been on the front lines for 50 years will be pushed to the side so the uber-wealthy can have more…. It should be stressed that in a true capitalist economy under free enterprise it is illegal for only certain individuals to hold a monopoly on any Commodity. This is a form of discrimination . The numbers are not reality The following was done by myself 7 – 2017. Set up. 3 illegal Dispensary on the same block. .
Each time i purchase the average buy of $20. Each time you would have to sign and show ID. The sign in sheet is numbered. I would know how many came before me. Hours of operations 8am to 2am 7 days. They staid in business 10 mo. This scenerio is common in Ca. Then fight it start a petition, stop f’n whining and do something! If you don’t fight, don’t complain. Write a speech I’ll deliver it to the state or whoever if your shy of public speaking or cameras. Damn I’m sick of people whining and not fighting. The mom and pops are the majority, but the government has us hating each other and suspicious of each other we won’t organize. FIGHT DAMN IT. WHEN INJUSTICE BECOMES LAW, RESISTANCE BECOME DUTY!!! I wish it was that easy!!! I do not have experience in the MMJ business but I did own a chain of Methadone clinics which is about as close as you can come to being similar to owning a MMJ. They are both heavily regulated and overseen by the DEA, State Dept of Health and other federal and local government agencies. They also both are frowned upon by about half the population and have ever changing rules and regs constantly. I found the MAT business ( medicated assisted treatment ) to be very similar in that you had some clinics making $1m to $3m per location and then others making $50k to $100k per year. It really has to do with patient population with rural clinics making much less than highly populated clinics. We had one clinic that could see over 1,000 per day and others that served only 150-200. ( The patients have to come everyday ) We had the largest clinic in one county right outside of a major city in the northeast and the other spots in very rural areas. We sold them to a private equity group in 2016 for a very good profit after almost 12yrs in business. We also had another clinic in our area that had 21 locations and sold for $112,000,000 dollars!!!!!! SO its really about population density and size. Both businesses are very complicated to run with all the strict rules and regs.